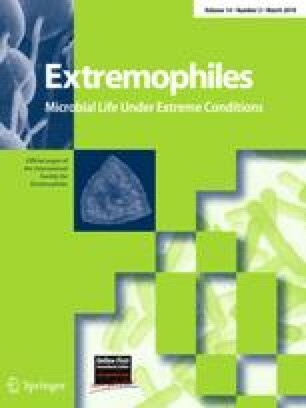 Little information exists about the ability of halophilic archaea present in hypersaline environments to degrade hydrocarbons. In order to identify the potential actors of hydrocarbon degradation in these environments, enrichment cultures were prepared using samples collected from a shallow crystallizer pond with no known contamination history in Camargue, France, with n-alkanes provided as source of carbon and energy. Five alkane-degrading halophilic archaeal strains were isolated: one (strain MSNC 2) was closely related to Haloarcula and three (strains MSNC 4, MSNC 14, and MSNC 16) to Haloferax. Biodegradation assays showed that depending on the strain, 32 to 95% (0.5 g/l) of heptadecane was degraded after 30 days of incubation at 40°C in 225 g/l NaCl artificial medium. One of the strains (MSNC 14) was also able to degrade phenanthrene. This work clearly shows for the first time the potential role of halophilic archaea belonging to the genera Haloarcula and Haloferax in the degradation of hydrocarbons in both pristine and hydrocarbon-contaminated hypersaline environments. The work was carried out as part of Yosmina Tapilatu’s PhD research and of the French National Program EC2CO “BIOHYDEX (BIOdégradation des HYDrocarbures dans les milieux EXtrêmes”). We thank the Centre National de la Recherche Scientifique (CNRS) and the Institut National des Sciences de l’Univers (INSU) for financial support. Y.T. was the recipient of a scholarship from the French Foreign Ministry.